HispaBrick Magazine 017 is out and ready for you to download. As always, the magazine comes packed with articles for all kinds of LEGO fans. A few days ago I posted part of an interview with Lee Magpili about designing the EV3 Education Core set, and in this issue you can read the complete interview. There are several more MINDSTORMS specific articles, including the next part of Koldo's tutorial which this time has a look at using files to calibrate several sensors for different tasks, and two articles on the NXT2WIFI sensor. The series of WeDo articles we started in the previous issue continues with a second part to the tutorial and a background article on the set, and Eric "Blakbird" Albrecht has again contributed to this issue with the third part of his tutorial on POV-Ray. 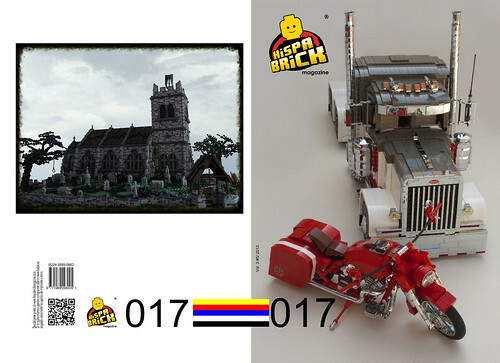 You may also be interested to read a review of TBs collaborator Nathanaël Kuipers' book, "The LEGO Build-It Book: Amazing Vehicles" which shows you how to build 10 cool models from a single set of (CREATOR) parts and explains the building techniques used. And of course there are many more articles, so download your copy now, either in English or in Spanish. Enjoy the read and don't forget to leave some feedback!